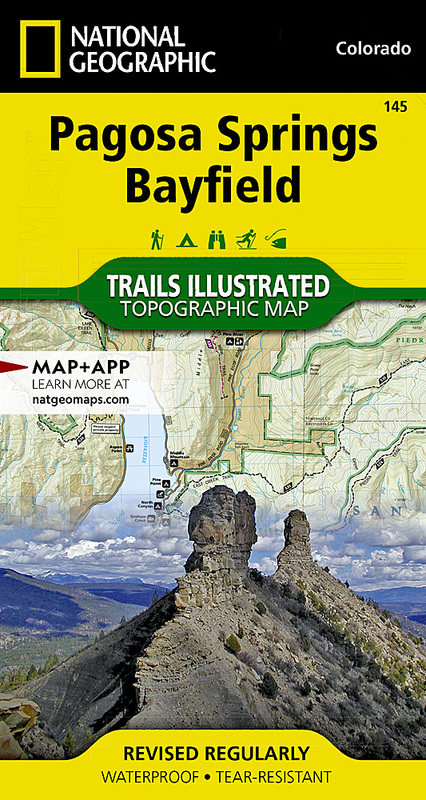 National Geographic's Trails Illustrated map of Pagosa Springs and Bayfield provides unparalleled detail of this area on the western slope of the Continental Divide in southwestern Colorado. Expertly researched and created in partnership with the U.S. Forest Service, Southern Ute Indian Tribe, Bureau of Land Management and others, the map's coverage includes San Juan National Forest, Piedra Area and River, Vallecito and Lemon Reservoirs, Chimney Rock National Monument and Southern Ute Indian Reservation. Get off the beaten path and back on again by following the map to trailheads and then along trails that are labeled according to their designated usage. High clearance and four-wheel drive roads are marked as well. To aid in your navigation, the map includes contour lines, elevations, labeled peaks, water features, waypoints, and clear boundaries between national park and Indian land, which is closed to the public for recreational purposes. Many recreation points of interest, for all seasons, are clearly noted, including campgrounds and campsites, cross-country ski areas and snowmobile trails, boat launch and river access points, fishing areas, scenic viewpoints and wildlife viewing areas. In addition, the map provides background information of the area, survival tips and contact information of both public and private organizations involved in maintaining the region. Other features found on this map include: Mesa Mountains, Navajo River, San Juan National Forest, Vallecito Reservoir, Weminuche Wilderness.